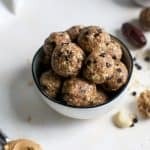 These Maca Peanut Butter Energy Balls are LOADED with the goods. Peanut butter, oats, maca powder, nuts and sweetened with Medjool dates. Vegan, gluten-free and basically the best snack, ever. Option to toast nuts beforehand: place nuts on baking sheet and bake at 325ºF for 8-9 minutes. Allow to cool. If dates are dry, soak in warm water for 5 minutes then drain. Be sure to pit dates. In bowl of large food processor add pitted dates, nuts and peanut butter. Process until nuts have broken down into small pieces and mixture is sticky. Add in maca powder and oats; process until mixture comes together adding water 1 tablespoon at a time. The mixture may feel somewhat crumbly, but should hold together once formed into balls. Add a little bit of water and continue to process if needed. Remove S-blade and fold in mini chocolate chips. Using rounded tablespoon, shape mixture into balls – you should get about 24 energy balls. Store in airtight container in fridge and enjoy!